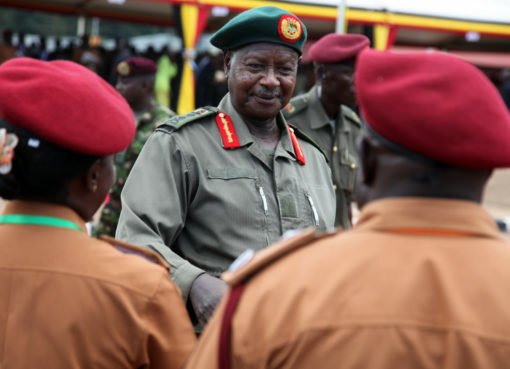 President Yoweri Museveni has blamed underdevelopment in Kawempe Division and Kampala City at large on the people who he said elected leaders who are non-performers. “I blame you for voting in people who cannot effectively serve you. Some of these MPs are busy undermining the Government efforts to ensure prosperity for wananchi. The Government has spent a lot of time allocating funds to enable the people through their districts. There are no new developments so far recorded,” he said. The President was speaking at Makarere University Primary School, Kubbiri in Kawempe Division, Kampala City shortly after commissioning and handing over a furniture workshop that he donated to Kubbiri Furniture Makers Development Initiative. The common user facility machines and a building cost Shs. 294 million. This also includes the donation of a truck to facilitate the transportation of timber. During the ceremony, he donated a cheque worth Shs.100 million towards the operations of their SACCO. “Kawempe Division became rebellious and voted for Museveni’s enemies. These people do not care for you but want to enrich themselves,” he added. Citing the example of Najera youth in Wakiso district who he recently facilitated with common user facilities in metal fabrication as part of Government efforts to help the people, Mr. Museveni expressed happiness that the Najera donation has assisted associations involved in metal works. He noted that 17 associations based in Katwe, Kampala have also benefitted from similar assistance. He, therefore, looked forward to the 52 associations of 1,500 members at Kubbiri benefitting from the new workshop that he has donated to them. The President informed them that he has personally come forward to help the people involved in various artisan trades that need help. He observed that Uganda today uses a lot of foreign exchange to import furniture the country has got people who can produce it locally. He said that the artisans at Kubiri have got furniture but lack showrooms in towns. He assured them that the NRM Government is committed to facilitating them in the struggle to build workshops and showrooms as this will go a long way in enabling the country get liberated from the slavery of importing goods that can be made domestically. 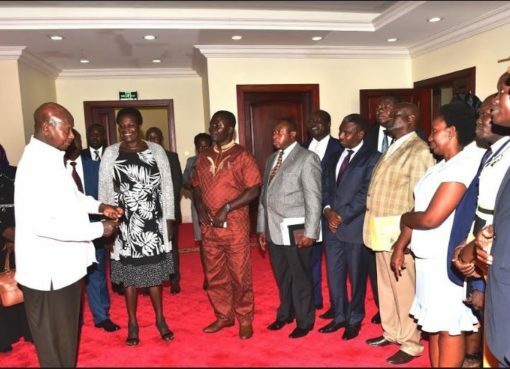 He praised them for getting involved in income generating ventures and also pledged help to the people who are engaged in furniture making in Kireka, East of Kampala City. Mr. Museveni disclosed that he will facilitate the various groups around Kampala with scholarships to China to empower them the more so that they attain skills in furniture making. Regarding security, the President vowed no tolerance to characters who harass and causing insecurity in some parts of Kampala. He warned that no one has got the right to harass others. He told the gathering that they have a debt of removing people in leadership who are opposing NRM in its development efforts in Kampala. Kampala City Authority Minister, Hon. Betty Kamya revealed that the people of Kampala are impressed with the support that President Museveni has given them. She saluted him for providing equipment to the working community to help them boost their ventures. While requesting the President to intervene and solve the challenges of insecurity in some parts of Kampala, Minister Kamya challenged the people to work hard as the Government has provided them with the required tools. The Chairman of Kubbiri Furniture Makers Development Initiative, Mr. Godfrey Kizito, saluted President Museveni for facilitating them with scholarships and working tools. He said the donation of a truck would promote their trade. He requested the President for more scholarships and showrooms. Nsambya Furniture Makers’ Chairman, Mr. Saddam Muleke Moses revealed that they have made big strides in their business following President Museveni’s donation of a workshop to them. He said that the facility has enabled them train several youths in furniture making skills. Later as he travelled to State House, Entebbe, President Museveni made a stop over at Namulanda along Kampala – Highway and directed State House Comptroller, Mrs. Lucy Nakyobe Mbonye, to look into the challenges affecting the youth of Method Construction Company Ltd who make bricks for sale. He also talked to the youth who are grouped under their organization called Kitubulu Car Washers Youth Group near Lake Victoria. He again directed the State House Comptroller to appreciate their challenges.